Samuelsson expects a big boost to Volvo sales from the XC40. STOCKHOLM -- Volvo Cars expects an expanded SUV lineup to help the automaker continue its growth steak this year. Last year, Volvo's operating earnings rose 26 percent to 14.1 billion Swedish crowns ($1.76 billion) with its vehicle sales up 7 percent to 571,577. Volvo CEO Hakan Samuelsson is bullish that the strong performance will continue in 2018. "This will be another year of strong growth and improved profit," Samuelsson told Automotive News Europe on the sidelines of the company’s financial results press conference here on Thursday. 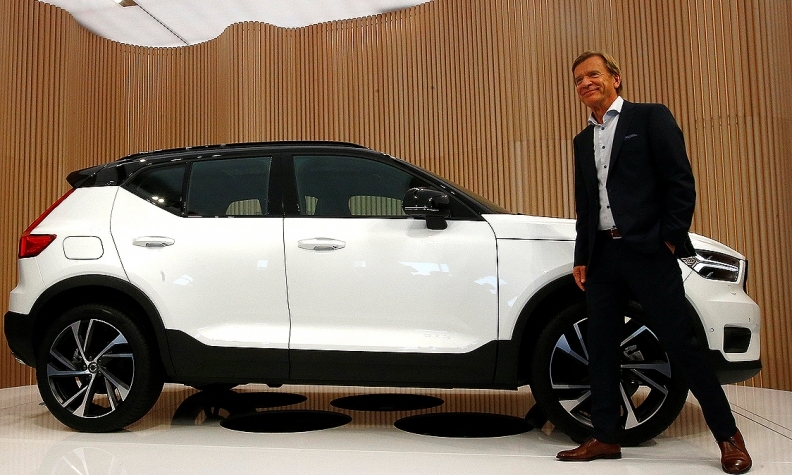 Samuelsson is optimistic because of the strong demand the company is seeing for its SUV lineup, which includes the recently launched second-generation of its top-seller, the XC60 and this year's arrival of the XC40, its first compact SUV. When asked whether Volvo could sell 600,000 vehicles for the first time this year, Samuelsson was reluctant to make an specific prediction. “We should continue growing at the pace we have,” he said. Volvo aims to increase annual global sales to 800,000 cars as early as 2020. Even at a modest 5 percent growth in 2018, Volvo’s global volume would rise above 600,000. While Daimler warned earlier this month that it expects its profit growth will be dampened this year by spending on new technologies such as electric and autonomous vehicles, Volvo believes it will avoid this problem by making tough choices. "We are prioritizing more than other companies because we can't do everything," Samuelsson said. "We have said openly that we cannot invest in a new generation of diesel engines because we are going to focus on electrification. I have not heard that from anyone else." In addition, he said that Volvo will benefit from not having to fully fund its investments in electric and autonomous solutions. The automaker will count on its Polestar subsidiary to handle the development of electrified powertrains while its Zenuity joint venture with Swedish supplier Autoliv will create the software needed by future autonomous cars. "With help from Polestar and Zeunity, we can keep our development costs at the same level we have had," Samuelsson said. Volvo Chief Financial Officer Hans Oscarsson added that the company finished 2017 with 12.5 billion crowns ($1.5 billion) in net cash. "I'm feeling very confident about our ability to continue to fund our investments," Oscarsson said during the company's financial result conference. While Samuelsson said that the share of Volvo's diesel sales is falling in Europe, a number of the customers who are leaving the powertrain are switching to the automaker's plug-in hybrids. The CEO said that about 15 percent of XC90 sales are plug-in hybrid variants. That's up from about 10 percent when Volvo debuted the technology on the XC90 in 2015. Volvo expects a similar share for the plug-in hybrid version of the new XC60.